This is to bring into your kind notice that LG is the only logistic organization which has worldwide network with a numerous no of centers which is again difficult to count on fingers and had a feather in the cap, which is known for its customer service and accuracy with a high level of customer satisfaction. Due to World cup season I had planned to purchase a TV because My family and Myself is very kind off Cricket and Thinking the above mentioned things in my mind I had prefer to Purchase a LG TV in place of other Brands. Myself is Jitendra Shukla living in Shukla Ganj which comes in city unnao. Shukla ganj is near By Kanpur So that I had decided it to purchase from LG showroom at place of any other Shops. 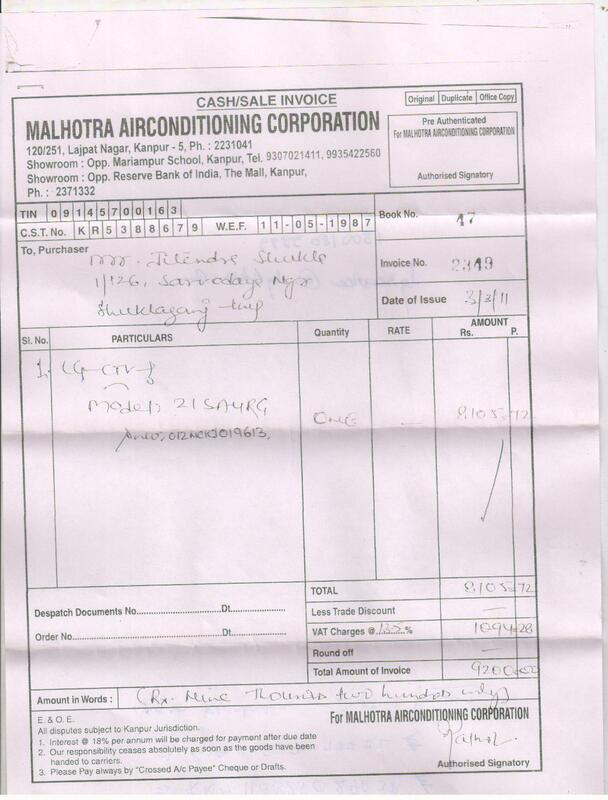 On 3rd March 2011 I had gone at LG Showroom which is established in Mariyampur Kanpur in the firm name ”MALHOTRA AIRCONDITIOINING CORPORATION” Add-120/251 Lajpat nagar, Kanpur-5,Ph:-2231041. There I had selected an ultra Slim TV which Modal no is-21SAURG. Sl no-012NCKJ019613. And purchased it thru Bill no-2349 dated-3 March 2011, at name Of Jitendra Shukla (Myself). I had paid total Rs-9200/- for my purchase. After 20 day on 24th March My TV Lying Dead. On 25th March I had raised the Complaint on LG Customer Care and they Had given the complaint No-RNA11032527698 and got the confirmation that with in 24 hour my problem will be solve. But this was very Bad experience that till 28th either No one came to solve My problem or Given me a single Call reg this again on 28th march I had make a call to customer care and request them that I had purchased a new TV on 3rd march and within 20 days it got dead so plz make it on priority Basis also I told them I had purchased this for Word cup season. Again they had Given Me a New complaint No-RNA110327077792. Now this time I have taken the Service center name which is ”Aakarsh electronic” Juhi-2 Kanpur. And 29th March Mr. Tahir (Mechanic) came and after a long time he Started MY TV but there was no Volume came so that he explain that the sound IC of TV has been damaged and it is not in our stock it will came from lucknow and after it my TV will got repaired. I asked him,”How much time it will take?” he explained me that within 5 to six day my TV will repair. According the same I was taking the regular follow up with Mr. Tahir on Phone. On Wednesday I got the confirmation that from Mr.Tahir that the TV will be repair on Saturday (2nd April) so as a reminder call I called to Mr.Tahir on 1st April. Mr. Tahir was not having complete information so he given me the No of service center. I had called to service center and asked for my complaint. There Mr. Abdul said to me that it will take one week time to come the part (sound ic) there was a long discussion was going on with service center people and me and my call was transfer people to people and they was only stand on their word that it will take one week time more. This was my first purchase which I decided to deal with Lg and my first experience was very worst and pathetic. Finally I want to talk with their seniors and my call was transfer to Mr.R.P.Nayar. He was adamant with the words which was service center people saying. So I said to him that the things which you are saying that a small part e.i. Sound IC will take one week time to came in your stock. So kindly given these things to me in written on your letter head. After my words he said to me that tomorrow my TV will be repair. Today after 3 O clocks I called to Mr.Nayar and he was only and only trying to Make me a fool. I had called him four times in a single day but No positive response came from your side. And after it the service center stopped to picking up my phone. And very hardly my phone was picked when I had called with another No. Mr. Abdul picked my phone and I wished to talk with Mr.Nayar so he said that Mr.Nayar is not in office I asked said him again the same matter so he is saying (passing comment on me) ”LG ek bhut bekar compney hai”. So I explained him that is not way on which he was talking with me. Also I never expect this type of words from LG service provider. Now I have lost my patience. And I am feeling very irritation with LG brand. I was very disappointed to the service of LG. A small Sound Ic is not available in a complete city Kanpur in any other Service center and it will came from Noida. And I have to only wait and wait still the part not came. I understand myself like a blameworthy who had bearing the punishment of Purchasing The Lg’s TV. Now I had no word to say anything. I chose the Lg Brand for its Quality and Customer service. But now I think that I had made a giant mistake in My selection. What will I have to do??? Is it my mistake to Having Faith at Lg Company??? Now I want only and only replacement of My TV. At my Home. No repairing require. Otherwise I also not know what I will do and what step I will have to take against Company?? Scan copy of Bill is attached.